The Progression form should only be requested once for each reporting month. Select the enrolments to send Progression form to. The form has now been sent to the learners. If you receive an error it will indicate what record and why this has occurred. Providers will be able to see which students have completed the progression and their intentions for study, but will not have access to the survey responses. Click on the eCAF ID for more information regarding the enrolment. Students have two weeks from the receipt of the invitation email to complete and submit the progression form. This is shown in Wisenet on the Creation Date. 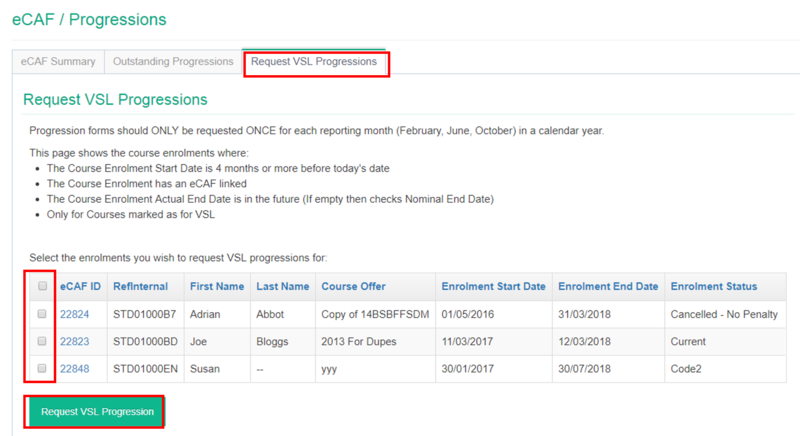 If you have submitted a Progression form manually through eCAF it will still display in Request VSL Progression. Wisenet is working on ways to exclude these Learners. When you run the Progressions in a few months time it will once again show the required Learners. If the form has not been completed and submitted by the expiry date – this is displayed in Wisenet on the Expiry Date. You can generate a new form, but is not required to do so (Go to Request VSL Progression). However, failure to complete the action and survey by the next progression point may impact on a student’s continued receipt of a VET student loan.